The very first thing I noticed about this book (which in the UK was published as Mr. Briggs' Hat) is that the blurb from the New York Times on the front cover pretty much gives away the show here, to the point where I almost chucked the book thinking "okay, so I really don't need to read it now." To me, putting that tiny bit of review there was a bad decision. I don't want to know the meat and bones of a true-crime case right away and then sit waiting for things to materialize -- I'd much rather discover things in the book as they are discovered in the actual case being written about. Boo hiss. That was definitely not cool. The crime under study here begins with a train stop at the "midway point on the line" between Fenchurch Street and Chalk Farm. 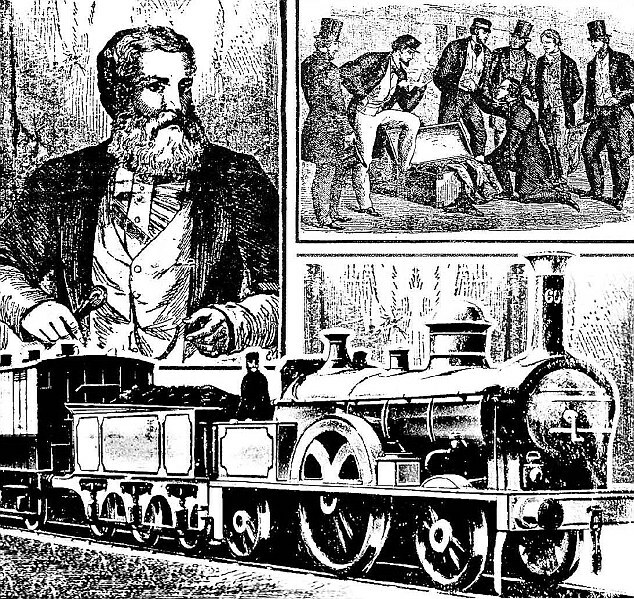 As a train guard is fretting over being behind schedule while the train is stopped at Hackney Station, he hears a "commotion" at the front of the train. 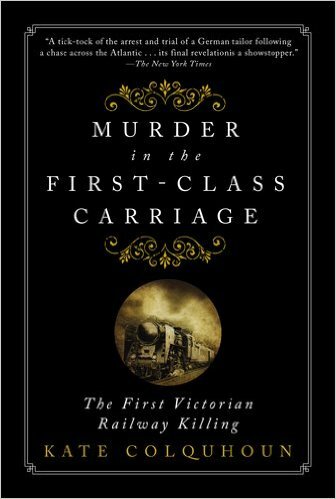 Two bank employees had just stepped into a first-class carriage, only to discover that it was filled with blood, still wet, spattered everywhere. Then he heard complaints from some women who had just exited the compartment next door, whose "dresses and capes had been stained by drops" that had come through their open carriage window while the train was still en route. Blood is everywhere, but where is the victim? All that remains in the compartment is a "black hat, squashed nearly flat," with the maker's name inside, along with a "thick cane topped with a heavy ivory knob" also containing "a few red spots" and a black bag. No one in the adjoining compartment had heard anything. The guard instructs the stationmaster to wire the railway superintendent at the end of the line; he then locks the compartment door and the train starts its journey. When the train reaches its final destination, it is met by the station superintendent who checks out the compartment and calls for the police; the hunt begins for whoever may have done this horrific thing. 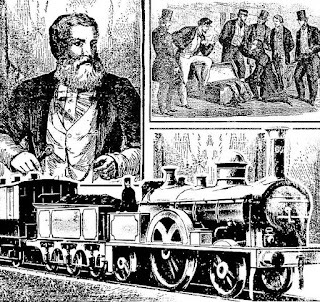 "The murder of Thomas Briggs in a first-class railway carriage so close to the centre of the metropolis, with its attendant air of impenetrable mystery, was supra-sensational.. It suggested an implicit threat to the day-to-day safety as a society as a whole, as if the plot of a novel were spilling over into reality." "a reality that unsettled every member of the public who travelled by train, shattering confidence in the security of their established routines." The book details the search for the killer by a very determined police investigator, as well as the arrest, trial and sentencing of a person believed to have done it. Whether or not the person was actually guilty is something the reader can debate -- the author has set things up so that rather than coming to a decisive conclusion, she offers evidence pointing both to and away from the person's guilt. from The Daily Mail. Do NOT click on this link if you don't want to know the murderer's identity! A couple of more points of interest and I'm out of here. First, the author weaves in several literary references into her narrative, noting the popularity of sensation fiction (Braddon, Collins, etc.) and how these took the reader out of the "urban criminal underworld favoured by Dickens" into "the apparently safe domesticity of rural country houses." The murders or crimes in these books, she notes, all ended with "the restoration of order" while in real life, the Briggs case was much more horrific since it took some time for police to come up with a tangible suspect. Second, not only does this case underscore how very limited options were for defendants in the courts at the time, but it also goes into an examination of executions as spectacle, a topic of great interest to me. 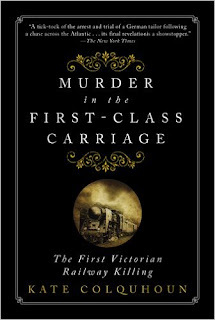 Overall, it's a good book and of particular interest to anyone interested in the Victorian period. There's a lot of cultural detail here around the crime that is quite interesting. On the other hand, it gets a bit boggy in the reading, with a lot of unnecessary repetition and to me some uninteresting bits about how this crime was a diversion from the American civil war, since the Inspector's pursuit of the suspect brought him to our shores. I am happy to have read it though, since I'm a huge fan of historical true crime. I'd recommend it to others who are interested as well. Nancy, a wonderful review: I love your musings and reflections, too. I don't really do "reviews." It's ALL my musings and reflections!! That way I actually enjoy myself while keeping a reading record.